ASSAMSTADT, GERMANY--(Marketwired - Dec 16, 2015) - Maintaining the integrity and reliability of equipment and assets is key to enabling higher levels of safety, efficiency and productivity within hazardous industries today. Maintenance (preventive, corrective and predictive) and Inspection activities are no longer a necessary evil, but a necessary pre-requisite to avoid unplanned shutdowns, remain competitive and reduce operating costs. Especially in potentially dangerous hazardous areas or harsh environments, the vision to achieve consistent maintenance and continuous improvement cannot rely on the old ways of paper forms and radios for efficient data exchange, communication & collaboration. However, help is at hand. 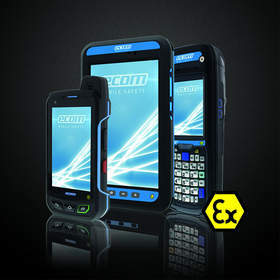 ecom´s evolutionary Mobile Worker framework provides a flexible and integrated wireless ecosystem built around rugged and explosion-proof mobile computers (tablets, smart phones, PDAs), wireless peripheral devices and smart software applications. This combination enables new levels of collaboration by helping maintenance technicians to stay connected to supervisors and maintenance experts, and brings new levels of productivity and data integrity. Production losses caused by unplanned and planned downtime can be minimised in hazardous areas by connecting and integrating the data held in "information silos", such as Excel spreadsheets and databases held by different sites, teams and people. Similarly, handheld computers working in "offline mode" (without access to wireless networks on the site) and handwritten notes are still being used to record data captured during periodic plant inspections. Both methods have the disadvantage that the onsite technician and remote offsite experts cannot rely on or share the latest centralized data to quickly identify and resolve problems or defects. As the pressure increases on maintenance teams to deliver ever higher productivity and better data integrity, the need for a solution which is designed to adapt to your changing needs is becoming essential. For automated equipment identification, the transition from barcode to RFID, and LF RFID to UHF RFID, are two examples of these changing needs. ecom's modular Mobile Worker ecosystem delivers the future-proofing and flexibility you expect by further extending the standard integrated capabilities to include LF/HF/UHF RFID, fast multi-range 1D/2D barcode scanners, wireless headsets, health/condition monitoring, Bluetooth beacons, and HART modems to name just a few. This ecosystem makes it possible to quickly and accurately identify equipment, tools, spare parts and even the location of employees. Maintenance jobs can be performed faster and more efficiently, significantly reducing the workers' exposure to dangerous areas. But, with an ageing workforce and a rapidly growing need to extend the desktop applications out into the field for visibility of work execution in real-time, the small screens offered by smartphones and PDAs limit their usefulness as a tool for these application types -- until now. With the 8 inch display provided by ecom's tablet Tab-Ex®01, planning, maintenance, SCADA/DCS, ERP (SAP/Maximo) and CAD applications are now practical to deploy in hazardous environments (Zone 1 and 2 / Division 1 and 2) where explosive gases or dust may occur. Supporting a wide range of wireless capabilities including 4G/LTE cellular, WiFi and Bluetooth BLE, Tab-Ex®01 DZ1 (the world´s first Zone 1/21 and Division 1 certified tablet) increases the opportunity for your teams to stay connected and have access to information on demand, when they need it. Based on the rugged Samsung Galaxy Tab Active tablet, Tab-Ex®01 DZ1 and TabEx®01 DZ2 (for use in Zone2/Division 2 areas) deliver new safety, compatibility and security capabilities not found on most rugged and "EX" rated tablets, reducing your exposure and risk. The ability to view and receive online permits, notifications, work orders, new decisions, documentation, drawings and even training videos, automatically or on-demand, now becomes a reality, ensuring the teams in the field stay connected and use the most accurate information. And, employees in potentially hazardous working environments no longer need to depend on sensitive and bulky printed documents on clipboards, when maps or diagrams are necessary to carry out maintenance or other activities -- Tab-Ex®01 can bring a digital version of this paperwork into the field, bringing efficiency, leading to cost reduction and even saving lives. Delays caused by materials or tools being unavailable or temporarily lost are commonplace for maintenance operations. But, it doesn't need to be this way. The use of barcodes and RFID tags to quickly identify materials and tools during issue, usage, movement, storage and return operations enables a fast and accurate way of keeping track of which items were issued, to which maintenance job, and to whom -- even scanning items which are located on racks 5 metres high. Given that many of these "track & trace" applications still operate on the Windows mobile IT infrastructure, ecom's i.roc® Ci70 PDA is an ideal fit, offering added flexibility with plug-in modules to suit your data collection needs. Knowing where materials and tools are when you need them can help to reduce the maintenance delays and the associated frustration and cost. Using the right tools can improve maintenance quality and efficiency. ecom's Mobile Worker framework provides a comprehensive, unified mobile solution built around rugged and explosion-proof mobile computers (tablets, smart phones, PDAs) to open the door to an easier and more connected way of performing maintenance tasks. In its four core disciplines of communication, mobile computing, portable lighting and measurement/calibration, ecom instruments offers reliable intrinsically-safe and explosion-proof products, wireless peripheral devices, and smart software applications -- all backed up with worldwide assistance from service centers in Germany, USA and Singapore and from ecom subsidiary offices to reduce your risk.